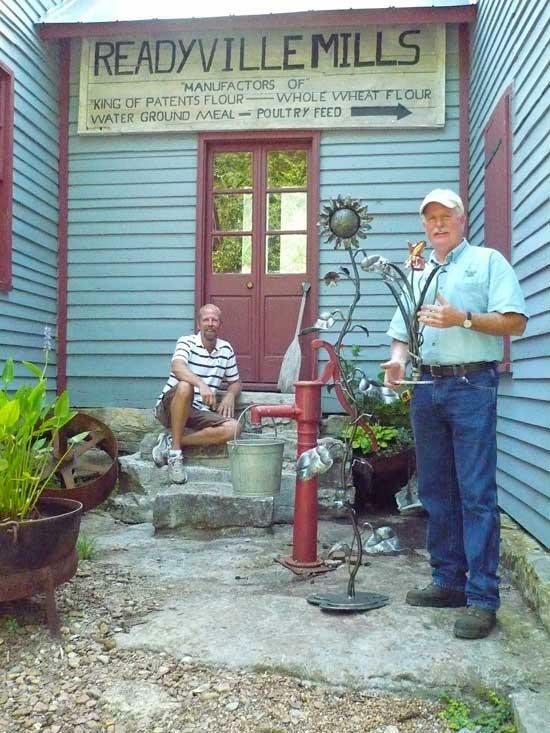 Readyville Mill owner-operator Tomm Brady, left, and ornamental blacksmith Joe Brown have teamed up to present Arts at the Mill on Friday and Saturday, Aug. 6-7. READYVILLE — Eight artists and craftsmen will offer their wares during Arts at the Mill Friday and Saturday. Aug. 6-7. “We’re calling it a show of fine crafts at the historic Readyville Mill,” said coordinator Joe Brown, Readyville’s artist blacksmith, about the event which will be held 2-9 p.m. Friday and 8 a.m.- 5 p.m. Saturday. Chef Mitchell Murphree, who operates the Kitchen at the Arts Center in Woodbury, will serve slow-roasted pork loins with cornbread salad, using corn meal from the mill, between 4-9 p.m. Friday. Performing acoustic music from 6-8 p.m. Friday will be Lorianna Matera and John Salaway. “The event was established to help renew interest for the mill now that it’s back in operation with flour being produced there, but it is also to promote the availability of the mill to be used for events,” said Brown. “We also we wanted to feature a group of local artists, upon which we can hopefully build on, and perhaps next spring or fall make the fine arts craft show into a larger event. “Most of us are residents of either Rutherford or Cannon County. We would like to let everybody know that there is a huge local craft community to serve the people of the area. We're trying to get people to continue to think local,” Brown said. Tomm Brady, owner and operator of the Readyville Mill, grinds meal from 8 a.m. to 1 p.m. Saturdays for the public. He will be doing so at the event. He sells three-and-a-half-pound bags of corn meal, grits and flour for $5 a bag. The four-story mill dates to the 1870s and sits on the same site as the original 1812 mill that burned in the 1860s. The mill is currently available for rentals for weddings, receptions, parties, reunions, school tours and luncheons. Seven weddings have taken place at the mill this year. “Norah Robinson handles all the booking for events and does a wonderful job. She also does the landscaping,” said miller Brady, who also does the mowing and weed eating. Besides the lovely old mill, the grounds feature a grainary building that can seat 85, the old icehouse where people may set up food for catering or hold dances, the miller’s cabin from the 1870s which brides and bridesmaids often use as a dressing room, and a picturesque log smokehouse. Brady also sells eight varieties of jams and jellies, molasses, prints and oil paintings of the mill, and Old Mountain cast-iron skillets. The site offers parking for about 150 cars and peace of mind beside a gentle riverside for anyone seeking rest for body and soul. More info: Email brownview@juno.com or go online to www.readyvillemill.com; phone: (931) 580-3631. For rental information, call (615) 409-1405.